01Shapely body, many degrees of Freedom, Audio output, suitable for character Robot. 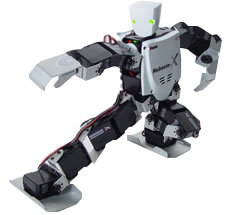 Robovie-X is the perfect robot for first time robotics builders. "X" stands for fleXible which is based on the concept and also represents the flexibility available with the large range of optional accessories that allows you to eXpand your Robovie-X robot. The Robovie-X is the standard model and comes with seventeen degrees of freedom and features VS-S092J servos which have 9.2kg/cm of torque. The VS-RC003HV onboard controller features a built-in audio system and an IXBUS connector which allows optional expansion boards to be incorporated into the robot to expand it's functionality. Robovie-X is available in three versions, that differ on the dimensions and on the power and number of the servomotors. Go to 'Robovie-X' specification. Go to 'Robovie-X Lite' specification. Go to 'Robovie-X PRO' specification. 03Versatile frame parts, easily remodeling and upgrading. 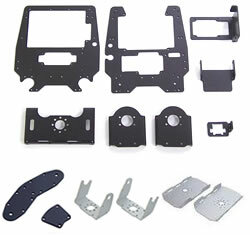 Robovie-X servomotor ‘VS-S092J’ has tapping screw hole to install a frame directly. So Robovie-X frames are useful and easy to remodel and modify. 04Audio output and Sensor expansion enhance robot's powers of expression. Robovie-X has two LED at eye and Audio output. So these enhance Robovie-X’s power of expression. It is capable of talking and moving with LED and sound synchronously. Expanding sensors with Gyro/Acceleration board and Analogue input board makes robot intelligent and functionable. Adding the PSD sensor, the robot can react for someone or objects. Copyright © 2010 Vstone Co.,Ltd. All rights reserved.